The show will add to Netflix’s growing list of exclusive content, including the hugely successful House of Cards, of which Gervais is a huge fan, and Arrested Development. Although Derek is not a Netflix production, it won’t be shown anywhere else in the above countries for an undisclosed period of time. Netflix’s streaming service accounts for 32.3% of all downstream internet traffic in the US/Canada, almost double that of nearest rival, YouTube. Netflix is already competing with the biggest TV broadcasters and many predict that online streaming service will soon replace the traditional cable TV. Derek coming to Netflix is clearly a forward-thinking and progressive decision and one that leads the way in what is more and more likely to be the future of TV broadcasting - the internet. So what is ‘Derek’? Well, if you don’t know, you've certainly come to the right place. Derek is a bittersweet comedy-drama about a group of outsiders living on society’s margins. Derek follows Derek Noakes (Gervais), a tender, innocent man whose love for his job at a retirement home shines through. Derek cares deeply for the home’s residents, because they are kind and funny and tell him stories of what life used to be like. Working alongside Derek is Dougie (Karl Pilkington), who is one of life’s unlucky individuals; Kev (David Earl), a loveable train wreck; and Hannah (Kerry Godliman), a care worker in the home and Derek’s best friend. She is smart, witty and hard-working, but unlucky in love, and, like Derek, always puts other people first. 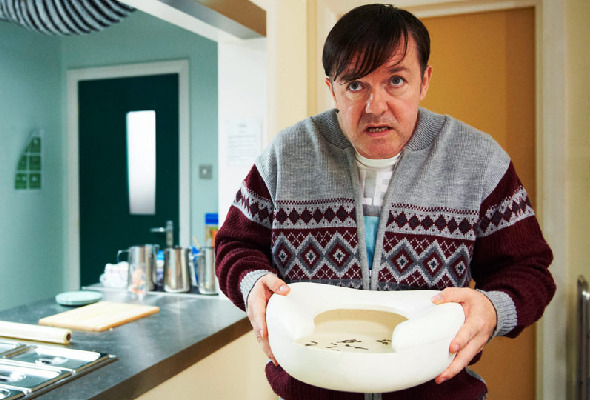 For those that have been following me on Twitter (@tadpole_hitler) or Ricky (@rickygervais), you will have been teased about Derek for a good six months, but don’t worry, the wait will soon be over!